darker than the skin treated by the laser? Yes, as you already indicated, that is OK. Treat each stretchmark only once in between rolling sessions. Yes, our instructions mention that Tretinoin cream should not be used ifpregnant, breastfeeding or planning a pregnancy. Vit. A healthy and very important, even in pregnancy (vitamin supplements intended for pregnant women do contain vit. A because it is so important) but the problem starts when you reach excessive levels of vit. A. Excessive levels can theoretically be dangerous for the fetus (at least they were for rats), especially in the first stages of pregnancy. You have to be careful, particularly with your oral intake. The companies producing vit. A creams advise not to use it in pregnancy, just to stay totally on the safe side. If you have just a couple of scars, it is OK but it should not be used on large areas. In your case, the areas are large. In general, in pregnancy and breastfeeding, you must be careful with everything, not just vit. A. (BTW, dermarolling highly enhances the absorption of all substances applied on the skin right after rolling). Senile purpura is caused by blood vessels becoming more fragile, mainly due to aging or in some cases due to sun damage. These fragile vessels tend to bruise extremely easily and without any seemingly adequate reason. The "purpura" is just a bruise. It slowly disappears by itself but sometimes it leaves permanent (iron) pigmentation. The best would be a 0.2 mm dermaroller used about every second day. Please let us know in several months whether it faded the pigmentation. You can replace the single needle with a 1.5 mm dermastamp. A sewing needle is totally unsuitable for microneedling the skin. Applying Tretinoin cream (we sell it) right after stamping is also helpful in case of stretch marks, surgical scars and other scars with hardened collagen. Yes, you should stamp each stretchmark individually in between the rolling sessions. You can stamp every day but stamp each stretch mark only once in between your rolling sessions. Dermarolling / Microneedling / Re: Can i use dermastamp instead of dermaroller? A dermastamp is the same effective as a dermaroller and you can use them on the same skin area. 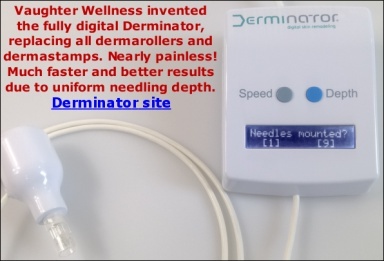 A one liner dermaroller is only suitable for long scars. A dermastamp is suitable for targeted treatment of all scars. For large areas of sagging, a dermaroller is a much better option than a dermastamp. Yes, you can still use the 0.5 mm dermaroller the same week. Wait approximately three days after using the 1.5 mm. Buy a 1.5 mm dermastamp and combine it with the suction method. A 0.5 mm dermaroller is a better option in your case than a 0.2 mm. A 0.2 is a good choice for post-acne or other pigmentations or for dilated pores. They'll need at least three weeks for production, I have just been informed. Then it will take another week or two for them to reach us. Dermarolling / Microneedling / Re: Is this all I need for a successful dermarolling treatment? Benzoyl peroxide is too harsh a chemical to apply right after stamping and there is no reason to apply it. It does not moisturize the skin, it actually dries it out and that is not a good idea right after rolling. If you cannot apply any moisturizing substance, then apply nothing at all. The skin is a very tough organ because it has to protect us. There is a lot of Keratin in the outermost layer of the skin and Keratin is the same substance that hooves and nails are made of so you can imagine how difficult it is to penetrate.